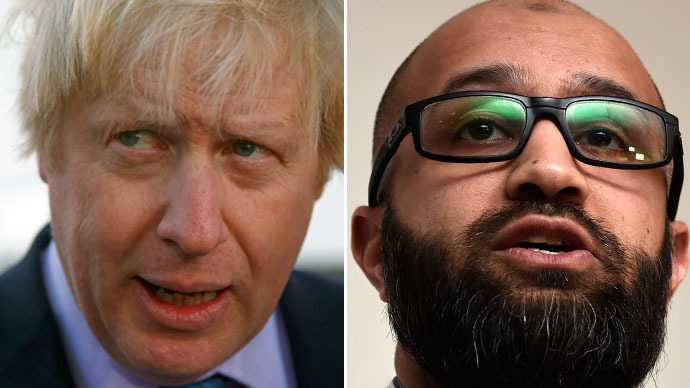 Johnson’s appraisal of Asim Qureshi’s perspective on the notorious Islamic State (IS, formerly ISIS) jihadist’s route to radicalization surfaced during a live LBC radio debate in London. Human rights group CAGE has been heavily criticized for suggesting UK secret services played a part in radicalizing Mohammed Emwazi, the notorious Islamic State executioner otherwise known as Jihadi John. In a bid to discredit this view, Johnson openly contradicted Qureshi on air. “I watched you explain how he had been seeking ‘a career overseas’ and had been impeded by the security services in finding his vocation,” he said. Johnson said Quereshi would be better off focusing his indignation and outrage on IS ideology rather than British spies. The Mayor of London stressed an organization that throws homosexuals off cliffs, beheads people who reject their variant of Islam, and glorifies the brutal murder of innocent journalists and aid workers is far more worthy of criticism than UK security officials. Since Emwazi’s identity was released worldwide, much conjecture about his early life and path to radicalization has surfaced. The 27-year-old IS affiliate was allegedly bullied as a schoolboy, but went on to become a “model employee” at a Kuwaiti firm. In 2010 and 2011, Emwazi emailed the Mail on Sunday’s security editor, Robert Verkaik, to report what he described as targeted persecution by MI5. In one message, Emwazi said he suspected he was being tailed by an MI5 secret agent. He told Verkaik he felt like a “dead man walking,” and feared for his safety. Emwazi claimed he had contemplated suicide. “I just want to get away from these people,” he said. Aside from his involvement with the Islamic State, Emwazi was allegedly a member of a London-based Al-Qaeda affiliate called ‘The North London Boys.’ He is also thought to be linked to a group of thieves who reportedly used Tasers to target wealthy people in London’s high-rent Belgravia district. Following its refusal to condemn Emwazi in a manner deemed appropriate, Amnesty International is considering severing ties with CAGE. It argues pressure from MI5 played a part in radicalizing Emwazi. The group’s theory has been angrily rejected by Prime Minister David Cameron. On Tuesday, CAGE released an audio interview of Emwazi dating from 2009 in which he describes an encounter he had with security services following a trip to Tanzania. During the recording, the suspected terrorist offered his views on political violence – specifically referencing 7/7 and 9/11. On the subject of 7/7, Emwazi said the terror attack was wrong, identifying it as an act of “extremism” that resulted in the death of innocent people. He said everyone was entitled to their own beliefs, but insisted his loyalty to Islam did not prompt him to criticize other people’s beliefs. The recording referenced a conversation Emwazi had had with what he claimed was a British spy. He subsequently said he was informed by the intelligence agent his movements would be under scrutiny.